Nicolee McMahon has been working in the arts for most of her life. She is a successor of Taizan Maezumi Roshi founder of the White Plum Lineage. She co-founded the Three Treasures Zen Community (TTZC.org) in the early 90’s. 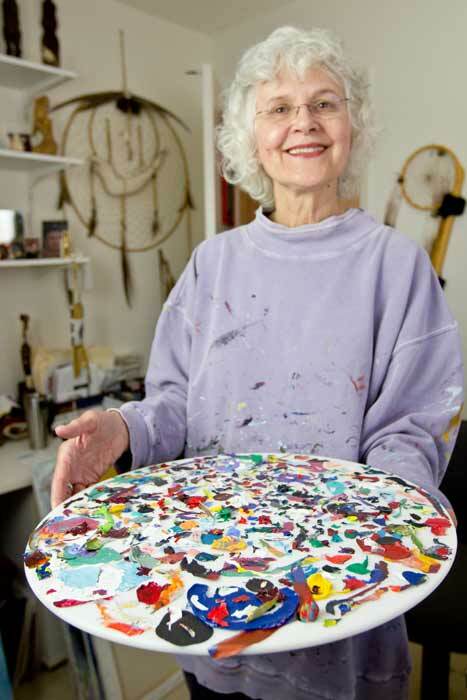 In 1997 she developed the Practice of Immediacy in the Arts® which integrates the arts, music, writing, poetry, movement, beadwork with the wisdom of Zen. The Practice of Immediacy in the Arts (PIA) also works if one does not have meditation experience and can be done at home, or in the studio. Nicolee is semi-retired but continues to lead and co-lead retreats throughout the year in which she incorporates the Practice of Immediacy into Zen retreats. She is married, has two grown children, a stepson, and four grandchildren. She lives in San Diego, CA, and is a retired Marriage and Family Therapist. Over the years of working with the Practice of Immediacy in the Arts, I have learned more and more deeply to surrender to a creative flow, and to trust the mystery of the unfolding moment. I often have a feeling of magic and wonder when a piece of art, music, beading, etc., feels finished. I also have a profound sense of gratitude to be able to share this amazing skillful means with others. My hope for the future is that others will discover the Practice of Immediacy in the Arts and make it a part of their lives.